Stand the chance to win total of RM1,500 cash prizes for Level Zero Startup Ideas!! 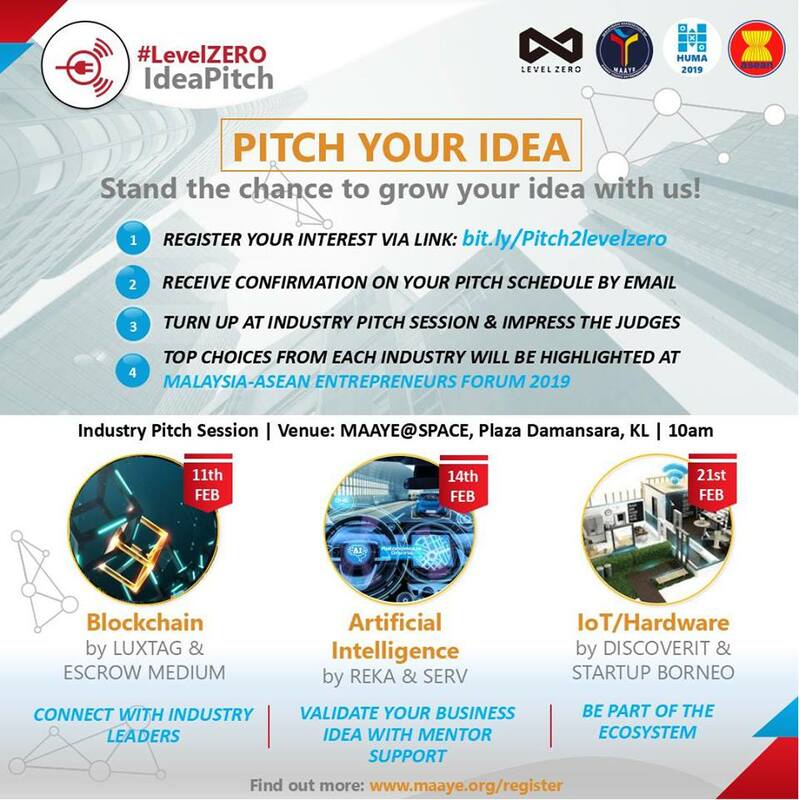 Calling early stage startups, studentpreneurs, & innovative minds in Blockchain, Artificial Intelligence & Internet of Things(IoT)/ Hardware to participate in “#LevelZERO IdeaPITCH” in conjunction with Malaysia-Asean Entrepreneurs Forum 2019 @ SMECorp! No concrete idea but have a passion? Never mind! Just turn up at selected Industry Pitch Session and talk to our mentors. Don’t miss the opportunity to participate and validate your business idea with mentor support! 1- Register your idea in the link: http://bit.ly/pitch2levelzero. 2- Receive confirmation & your pitch schedule via email. Limited spot per session, so register fast! 3- Develop your idea with assistance of our mentor. Top chosen ideas will be selected to pitch for #LevelZERO Final Pitch Session & will be featured in the Malaysia-Asean Entrepreneurs Forum 2019!